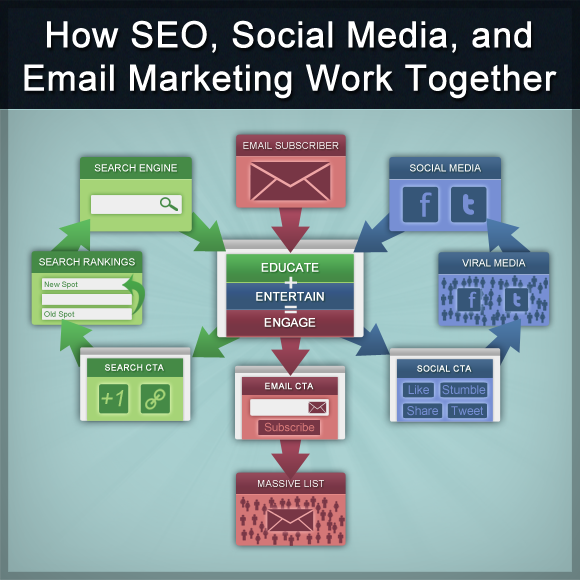 Email is the only online platform we use regularly where we see every message we receive. For that reason, an email subscriber is the most engaged someone can be before they become a customer. So the goal of your blog should be to encourage people to opt-in for getting free email updates every time you post a new article. There are only three ways to get traffic without buying ads or relying on other sites to actively promote you. As long as you have the SEO prerequisites set up, Google, Bing, and Yahoo! will automatically index your website as you update it with new content. The more often you update, the more often Google will check back. Every time you update your blog, mention it on your Facebook page, Twitter stream, LinkedIn profile, and wherever else your audience is following you. But be careful about submitting your content to StumbleUpon, Reddit, and Digg. It’s more likely to get picked by those sites if it’s submitted by someone who is unaffiliated with your site. 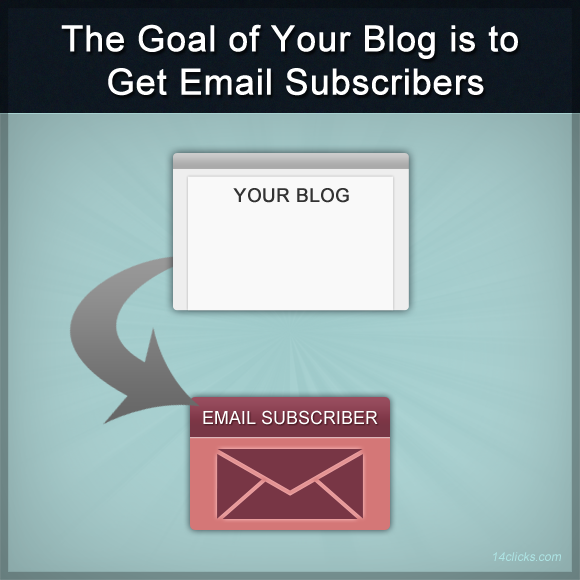 Similar to social media, get in the habit of sending every new blog post to your email subscribers. If they get it every time, they’ll expect it every time. 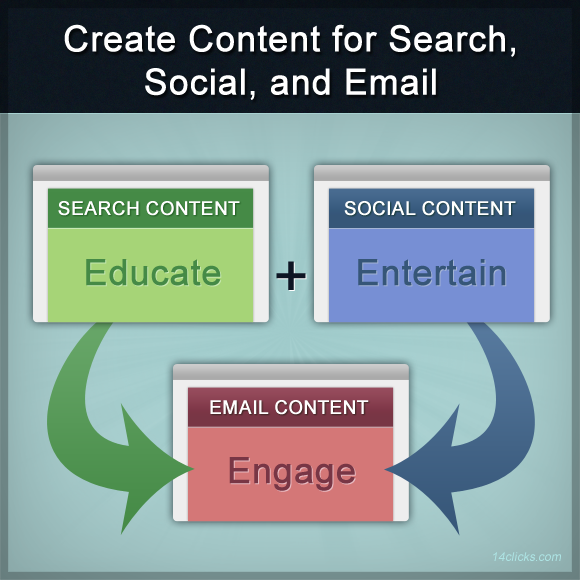 In order to get traffic from search engines, social media, and email marketing, you need to create content that appeals to each of those platforms. When someone Googles something, they’re looking for the answer to the question. So you need to create content that educates and answers questions. Tutorials, how-to’s, step-by-steps, questions, and checklists. 61 Steps to Becoming a Successful Young Entrepreneur – The 3rd most viewed post here and Google is the 2nd highest source of it’s traffic (behind JuniorBiz.com). Why Do You Want to Be an Entrepreneur? – Ranks 6th for “why do you want to be an entrepreneur” out of 18.9 million results. People share interesting links on Facebook and Twitter because it makes them seem interesting. 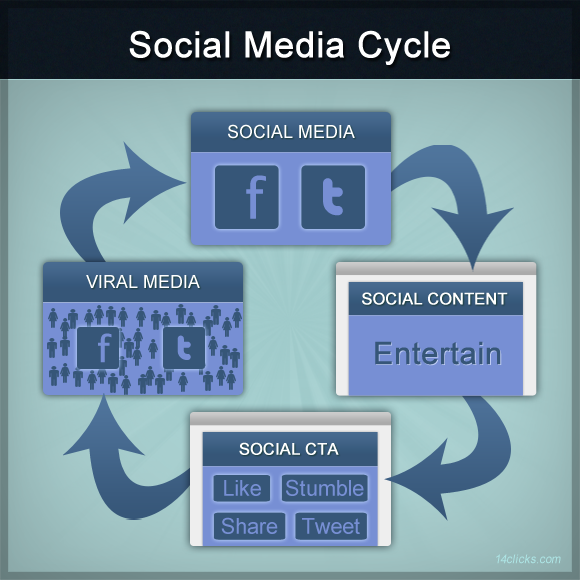 When someone clicks a link on a social network, they’re expecting to be entertained or informed. Write controversial editorials, create interesting lists, break the news, make creative videos, tell fascinating stories, and highlight neat facts. 101 Things I Wish I Learned in Business School – The first post here that got a fair amount of social traffic. The Average Employee Costs $412,429 – 60+ Likes because it’s controversial and people comment on it when someone posts it to Facebook. 10 High-Powered Executives with $1 Salaries – 80+ Likes partly because of the call to action at the end. Nobody spends hours on Yahoo! Answers and no one falls in love with FMyLife (well, maybe a few). Both of these sites get boatloads of search and social traffic, but neither of them have diehard fans who eagerly hang on every word they publish. The key to getting your audience to leave comments, subscribe to your feed, open your emails, devour your thoughts, and share it with their friends, is to engage them with content that simultaneously educates and entertains. Create ultimate lists, explain provocative concepts with graphics, produce epiphany-inducing videos, teach through well-developed metaphors, and tie relevant news with enlightening commentary. Best 101 Entrepreneurship Quotes Ever – On the first page for “entrepreneurship quotes” and 7K+ 11K+ 27K+ Stumbles. 21 Famous Logos with Mind-Blowing Hidden Messages – All 21 logo images rank for “[company name] logo” and it has 50+ social shares. 10 World-Class Companies Started by College Students – First page for “companies started,” “companies started college,” “companies started college students,” and #1 out of 171 million results for “companies started student.” Plus it’s interesting to nearly everyone. 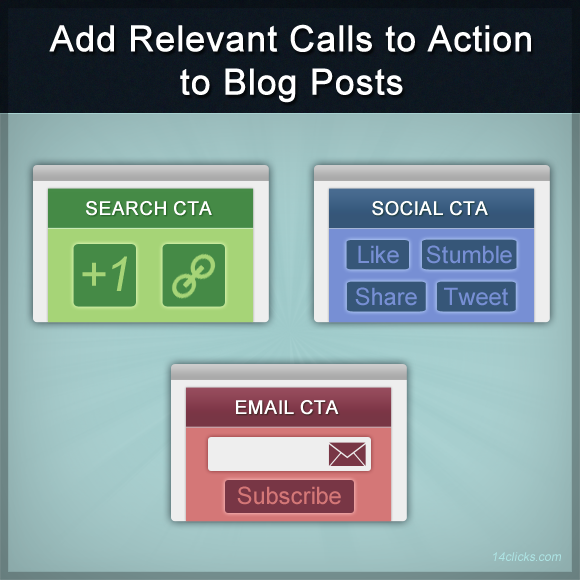 To get the most out of your content, add different calls to action at the end of the article depending on where you expect the traffic to come from. The number of +1’s, Tweets, and backlinks all affect how well you rank in Google. If your content is mostly educational, ask for one of those three so it’ll rank higher and you’ll get more search traffic. If your content is meant to entertain, ask people to Like, Tweet, or Share it with their friends, followers, or network (depending on where you believe your audience spends their time). For instance, I’ve found that most young people use Facebook more than Twitter or LinkedIn. So I emphasize Facebook by putting the Share button at the top of the scrolling social bar and on the left at the bottom of the post. If you believe your post is educational and entertaining, ask them to subscribe for free updates. You can include a link to a squeeze page or put a simple opt-in form at the end of the article. No matter where the traffic comes from, your goal is to get them to subscribe by email so they contribute to all three sources of traffic in the long-run. Starting at Google, someone searches a keyword that brings up your site. They click the link to read your content. If it answers their question, ask them to +1 it so your blog post will rank higher for the original keyword. 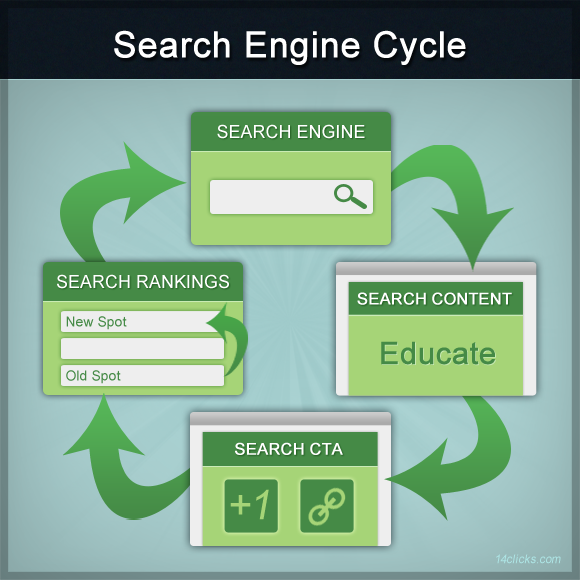 As it ranks higher, you’ll get more traffic and continue the cycle. Starting on Facebook, Twitter, LinkedIn, etc., someone sees a link to your content. They click the link expecting to be entertained. If they are, ask them to Like, Tweet, or Share it depending on where you want your content to be shared. If they share it, their friends will see it and the cycle will continue. Starting with one subscriber, that subscriber gets an email with the headline as the subject. If the headline is engaging, they’ll open the email, click the link, read the article, and enjoy your content. The call to action may be to subscribe, but since they’re already subscribed, they’ll either +1, Like, Tweet, or Share it. This dips back into the SEO and social media cycles until those people choose to become subscribers. This is how you build an incredibly engaged audience with a massive email list. 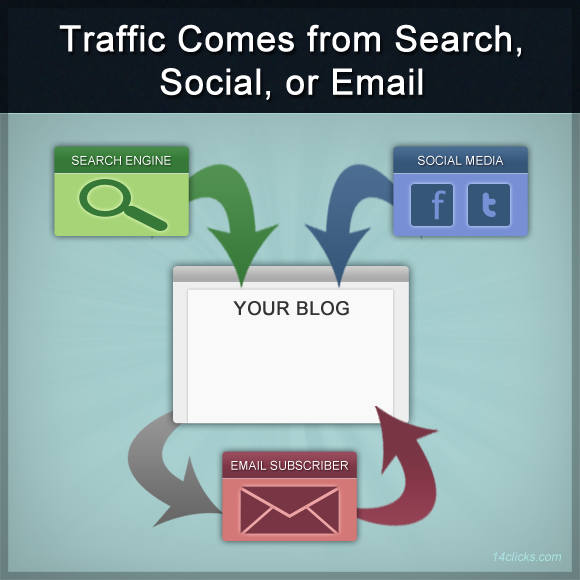 No matter where the traffic comes from, your goal is to get them to subscribe by email so they contribute to all three sources of traffic over time. Engaging? Then subscribe here (and get a free copy of my ebook). If you thought this post was all three, do all three. It’ll help you and others find content worth finding. Thank you.. I think that’s for you to decide, Daniel. But it needs to be original. What type of blog do you want to have? This is a great post! Up for this one. Will definitely share this. Graphics are helpful to understand everything. Have a great day. Hey thanks, Jonathan! I enjoyed synthesizing the concepts into graphics, but they were time-consuming. Would you like to see more posts like this? You’ve quite a lot of points there and I do agree with you. You’ve provided a diagram that could be comprehensible and easy to understand. I’ve learned excellent things and information from this post and I thank you very much for that. You’re welcome, John. What are a few things you learned in particular? Thank you once again, John! It’s good to know that the diagrams helped. I’m going to try to make more posts like this every once in awhile. Your post has provided accuracy and clarity to a topic that the majority of marketers have. Which is: How to drive traffic and build a “massive list”. The crux of the problem is creating the quality content that educates, entertains and engages the audience. And the only way to get good at that is to create content on frequently and consistently. I agree, James. That’s the hardest part. The rest is just a series of things you need to do. Have you found any good ways to consistently create quality content? That’s a very good point, Piet. 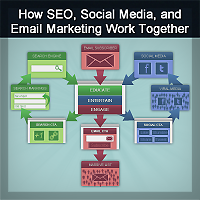 They focus on email, but they also integrate SEO and social media into the process. It is quite comprehensive. Thank you. I have a back-ground as far as computer usage is concerned. I only have expertise in office application. Nowonder this is Africa. Which kind of training do you think i need to become efficient in internet usage, networking, database desing and application. 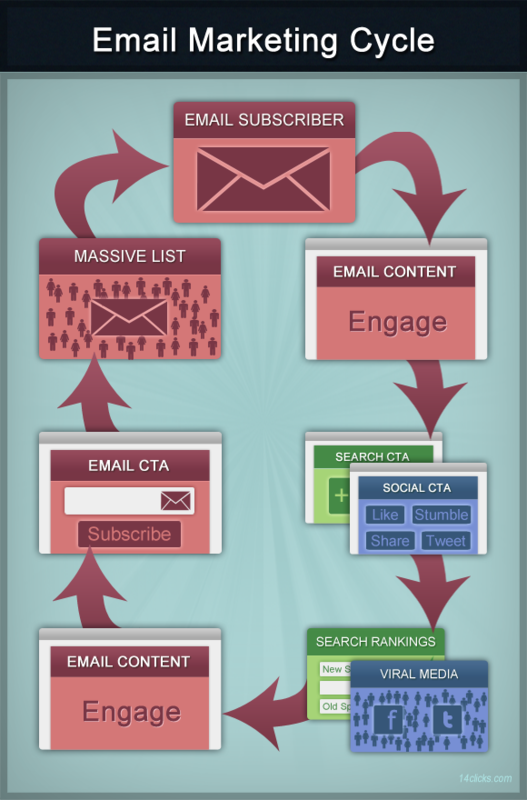 29 Email Marketing Resources To Help You Master Email.